Walking past a junk shop = quick look inside, and almost buying a bookcase. Antiques shops + credit crunch = search on Ebay instead. Search on Ebay = bidding for a chair I don't need, because it is 'pick-up' only, and I think I have a chance of getting it. Bidding for a chair I don't need = renewed conviction that there are lots of bargains on Ebay. Conviction that there are lots of bargains = continued Ebay search, this time in clothes, and even in 'vintage' clothing. Search in 'vintage' clothing = lots of bids on dresses I'm not sure I really like. I think two might even be polyester, with pleats. 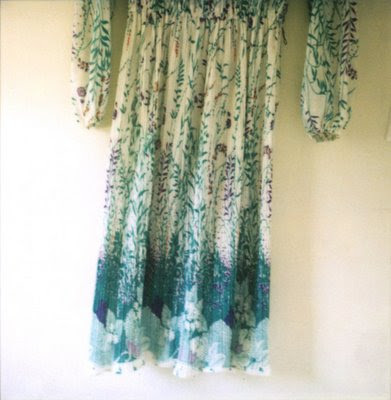 I blame this dress, via My Polaroid Blog, which got me thinking that I should buy more second-hand clothes. I think it is beautiful. I still haven't decided whether to get the bookcase. It would be a 'temporary' bookcase, until I can afford what I really want. But I am getting quite concerned at the amount of temporary furniture I have acquired, mostly from Ikea. I turned down going to a black tie dinner this evening, because it was £50 and I'm supposed to be saving money. I need to stop my Ebay frenzy. Photo by Jen Gotch, via My Polaroid Blog. haha i too often find myself in the same kind of "unfortunate series of events" ! GET THE BOOKCASE. Life is short! I am a bad influence-sorry! Get it-go go go GO. then post it. I want to see it. Yes, but isn't it so much fun?! The thrill of the "hunt"! Get the bookcase...I want to see it too! LOL I had to stop looking at e-bay but unfortunately I've discovered Etsy - stop me NOW. Confessions of a shopoholic! Sounds like the kind of crazy stuff I do. Luckily I have managed to get it under control lately. A dreamy pola can make just about anything look good, so don't be fooled into thinking you have to have a vintage dress! This post = me laughing out loud. Me laughing out loud = feeling cheered after a long day. feeling cheered after a long day = wanting to indulge myself with a little online shopping. wanting to indulge myself with a little online shopping = continued conviction that recessions have the best sales. continued conviction that recessions have the best sales = me buying crap I would never pay full price for but I'm a sucker for a "bargain".